Happened to trip across this entry. 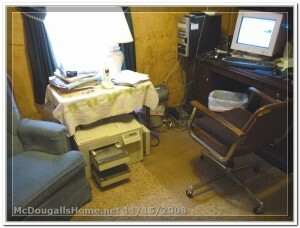 I have a LaserJet 4siMX I bought for $25 in, um, 2006? Similar to yours except it has PostScript and an Ethernet port on the back as well. There is one thing in your entry that I think is incorrect, though. “we have enough toner to last the life time of the printer.” No you don’t. 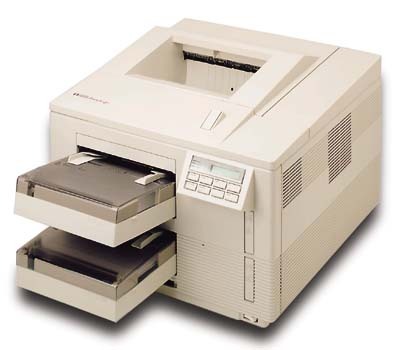 The 4 series saw the introduction of the 4MP, where “P” meant Personal; the first time HP even considered the idea that an individual would actually buy a laser printer for the home. The I, II, and 3 series were build for businesses, and most of the 4 series was as well. The 4si retailed for well over $5,000; they expected that buyers would pay extra for reliability. Even if you neglect the recommended maintenance, that printer will probably keep working for at least a couple more decades. So no matter how slowly you print, I think the printer will last longer than the toner cartridge unless you deliberately ‘put the printer out of its misery’ because your new bio-integrated brain-interfaced computer in 2043 projects all printed material in virtual space in front of your eyes, and you don’t need to print anything anymore. Oh, and if you’d like an Ethernet interface, I have found those are surprisingly common, and of course, practically free. In fact, I have three of them, even though the printer can only have two different interface cards plugged in at the same time. Thanks for the comment. Yes, I agree with you completely. I guess that I should have said, that I have enough toner for as long as I have the printer. 🙂 I’m sure the printer will outlive our use of it. Hello and I hope life find you well. Very interesting site and I couldn’t missed your 4Si page. Exquisite durable printer, build in time of different mentality concerning quality. And on that note, I wanted to kindly ask you a small favor, whenever will or time strikes you to do so. I would need for my HP archive models, if you could be so kind enough to just print me the test page from 4Si. Just general start page accessible from front panel. Then if you could scan the same in best quality you can, and send me via email. 4Si is not that easy to come by, and I would love to have his test page.